IRVINE, Calif. – No. 18 Dixie State softball clinched its fourth NCAA West Super Regional berth in five years on Saturday with a 4-3 win over Concordia-Irvine in the West 2 Regional Final at Eagles Field in Irvine, California. For the second time in as many days, the Trailblazers (41-8) found themselves in early 1-0 hole against the Eagles. And for the second time in as many days, DSU found a way to bounce back to claim the victory as Jessica Gonzalez blasted the game-winning grand slam in the third inning. Like Friday’s matchup with Concordia-Irvine, the Eagles opened the scoring in the second inning, scoring on an RBI-single up the middle to build a 1-0 lead. But unlike Friday’s game, Dixie State didn’t wait until the fourth inning to get on the scoreboard. Janessa Bassett drew a leadoff hit-by-pitch in the bottom of the third, then stole second. Brenna Hinck then walked, while Bailey Gaffin advanced both Bassett and Hinck with a sacrifice bunt. Kenzie Sawyer worked to a full-count, then walked to load the bases. 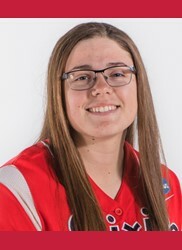 Gonzalez wasted no time giving the Trailblazers a 4-1 lead, blasting the first pitch over the center field fence for her second grand slam of the season. The Eagles answered with a pair of runs in the top of the fourth to pull to within 4-3, but couldn’t get any closer as the Trailblazers clamped down defensively. Over the final three innings, Cambrie Hazel, Dani Bartholf, and Gaffin combined for the nine outs needed to clinch the victory. Hazel recorded five strikeouts over the final three frames, while Gaffin notched three assists at shortstop, and Bartholf made a highlight-reel stop and toss to first for the final out of the fifth. Gonzalez led the way at the plate, going 2 for 2 with the grand slam, a walk, and four RBIs, while Gaffin also finished with two hits. Hazel (19-3) tossed another gem in the circle, allowing just one earned run to go with eight strikeouts to finish with a 3-0 record at the West 2 Regional. 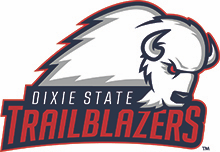 Dixie State will now host No. 2 (and West Region No. 1 seed) Chico State in the NCAA Division II West Super Regional on Thursday and Friday at Karl Brooks Field. Official game times will be announced on Monday. The Wildcats clinched the West 1 Regional with a 7-2 win over California Baptist on Saturday.